To accompany the next few rounds of One LibraryThing, One Book, we’ve rolled out another nifty feature that’s been requested for quite some time now: a spoiler tag. Use it throughout OLOB discussion, and anywhere you deem necessary on LibraryThing. 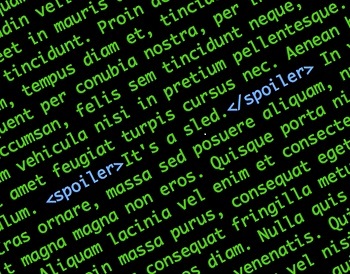 If you’re desperate to share what happened at the end of a good book, but don’t want to give too much away, just wrap the sensitive lines in a spoiler tag. You’ll avoid unintentionally ruining someone’s read-through (and if they do actually click on it, well, they’ve had fair warning). Let us know over on Talk.